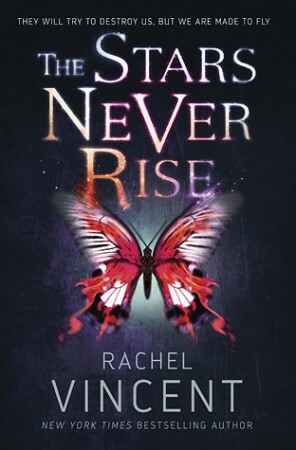 The Stars Never Rise was one of my most anticipated books of the year. It’s one I had been waiting for for two years, ever since the author said that she was working on it. I fell off my bed when I got the email saying I could review it for the publisher, because I was just SO. DAMN. EXCITED. But – yes, you can see where this is going – I was disappointed. I really, really hate to say it, because Rachel Vincent’s previous series are some of my all time favourites. Her Shifters series was thrilling, the Soul Screamers series was hilarious and addictive and had an OTP, and the Unbound trilogy was absolutely superb. So I hope you can understand why I was disappointed when The Stars Never Rise turned out to be a three star read. No, it’s not bad at all, it’s actually pretty good, but I was expecting something amazing. The Stars Never Rise is in no way a bad book, but it did feel pretty generic. I think people who read less YA would probably enjoy this book more, because they would be less used to the tropes and themes used in it. In this book, we have the mysterious hot guy showing up in the first chapter, the love interest with gorgeous and unusual eyes that everyone seems to be talking about, the not-quite-instalove but the I-will-do-anything-to-protect-you-after-a-day-of-knowing-you-love, the fading to black almost cliffhanger, and that’s just off the top of my head. It just wasn’t unique enough for me! I’m not going to lie, I went into The Stars Never Rise expecting a story about two sisters who would do anything for each other. Think Furiosa and the wives in Mad Max, or Xena and Gabrielle, or actual siblings Bellamy and Octavia. But instead, Nina’s younger sister is absent for most of the book and is hardly featured at all aside from in the beginning. It was disappointing, to say the least. Instead, Nina spent most of her time with a new group of people and we learnt about the world they live in and all that jazz. I did, however, really enjoy the world building. I loved the narrative regarding the Church and I was reading out bits and pieces to my mum. I liked the idea of a war with demons, in a Supernatural kind of way, and I liked the strict society that the main character had to break free from. As always, I loved Rachel Vincent’s writing style. It’s always addictive and captivating, and she really is a great writer. It’s just a shame that this book was such a cliché in all other regards. I will definitely be reading the sequel and the rest of the series if there are more than two books. I love Rachel Vincent too much not to. No! That is so sad to hear. I was looking forward to this book but I don’t want it to suffer from all the tropes! But it was still a decent read and you are continuing the series, so would you say this is a buy book or a library one? I had planned to wait until I can buy it to read it, but if it’s not going to be epic, I may just take a trip to my library instead. Based on the book’s description, I can see why it disappointed you. The relationship between the sisters reads as being a key part of the book. That said, having been warned by you what to expect, I’m a bit more inclined to give this book a try.